Sixteen-year-old Tatum Elsea is bracing for the worst summer of her life. After being falsely accused of a crime, she's stuck under stepmother-imposed house arrest and her BFF's gone ghost. Tatum fills her newfound free time with community service by day and working at her covert graphic design business at night, which includes trading emails with a cute cello-playing client. If Tatum is reading his emails right, her virtual Prince Charming is funny, smart, and talented-and he seems to think the same about her. Too bad he's spending his summer across the ocean in Ireland…not that Tatum would be allowed to go on a date anyway. But over the course of the summer, Tatum will learn that sometimes going after what you want means breaking all the rules. And when Tatum discovers she's not the only one in the house keeping secrets, she finds she has the chance to make amends with her family and friends. Equipped with a new perspective, and assisted by her feisty step-abuela-slash-fairy-godmother, Tatum is ready to start fresh and maybe even get her happy ending along the way. 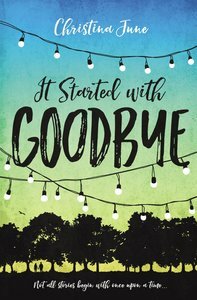 A modern play on the Cinderella story arc, Christina June's IT STARTED WITH GOODBYE will appeal to fans of Sarah Dessen, Stephanie Perkins, and Jennifer E. Smith. About "It Started With Goodbye"
Christina June writes young adult contemporary fiction when she's not writing college recommendation letters during her day job as a school counselor. She loves the little moments in life that help someone discover who they're meant to become--whether it's her students or her characters. Christina is a voracious reader, loves to travel, eats too many cupcakes, and hopes to one day be bicoastal--the east coast of the U.S. and the east coast of Scotland. She lives just outside Washington, D.C., with her husband and daughter. Customer Reviews For "It Started With Goodbye"
This is a modern-day retelling of Cinderella and it is such a cute and fun read! I enjoyed it!